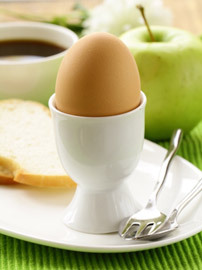 Here at Nutracheck we've always had a soft spot for eggs - despite all the bad press they've had over the years. And what better news than finding out through new research that eggs are actually even better than we previously thought! Eggs are one of the simplest and most nutritious foods available, full of essential nutrients including protein, vitamins and minerals. Being one of the main sources of good quality protein in our diet, and suitable for vegetarians, means they offer a good all round option. Protein is essential for general health and for the repair and growth of cells in our bodies and is a particularly important component of muscle tissue. Eggs also provide a whole host of other nutrients including vitamins A, D, B12, and riboflavin and also iron, a nutrient that is often lacking in diets, particularly vegetarian diets. So what's changed - why are eggs even healthier? In the UK, the nutritional composition of foods are constantly being reviewed to make sure we're giving the right advice about what we should and shouldn't eat, and eggs are just one of the foods that have been looked at recently. Improvements in the way hens' are looked after and fed, and changes to the way that we analyse nutrition in food has led to quite surprising changes in the levels of important nutrients in eggs. But aren't eggs high in cholesterol? Cholesterol is found in many animal foods, including egg yolks. In the early days of research on cholesterol, researchers wrongly believed that the cholesterol in egg yolks could increase the risk of heart disease, mainly by raising the cholesterol levels in our blood. More recent research has now been disproved this theory and we now know that it is in fact saturated fat in our diets that raises blood cholesterol levels (and not dietary cholesterol). High circulating levels of cholesterol in the bloodstream are linked with an increased risk of heart problems, caused by the development of fatty deposits on the walls of our arteries. So rather than worrying about levels of cholesterol in our diets, or how many eggs we're eating, we should be more concerned about saturated fat which is found in foods such as full fat dairy foods, meat, pastry, cakes and biscuits. Now that we know that cholesterol in eggs isn't a health issue, old restrictions on how many eggs we should eat have been lifted. This is based on a number of research publications which have disproved the old information about eggs having a negative effect on cholesterol levels. In brief, the research has shown that eggs, as part of a healthy balanced diet, do not raise the risk of heart problems or stroke in healthy adults, and it is now accepted that one or two eggs a day won't cause problems. Together with the fact that eggs contain 20% less fat, 20% less saturated fat and 13% less calories than 30 years ago, plus providing a host of other valuable minerals and vitamins, they can be a great addition to a varied and healthy weight loss plan. The nutritional changes to eggs are in the process of being updated in the databases that we use to calculate our calorie and fat information - as soon as this is done we will be updating the Nutracheck database too! So next time eggs are on the menu for breakfast (or lunch or supper for that matter! ), whether boiled, scrambled or poached you don't need an excuse to tuck in.